So, one of the things about eReading is that I can't partake of my habit (some say it's a bad, bad habit) of flipping to the end of a book that I'm not reading as quickly as I might. Yes, I do this with mysteries too. It doesn't really bother me to know how it turns out, and if I'm not swept into the book immediately I just... like to know. If it's worth it, or something. I can't really explain. Anyway. It's a good thing I didn't do that with this book, I have to say, because I think I would have stopped reading. There are several dramatic twists, including one that, had I known it was coming, I might have quit up top to spare myself the pain. So perhaps this is a lesson: anything I want to read through regardless of the ending I should probably read on the Kobo. This is the fourth book in Raybourn's Lady Julia Grey series. If you don't want spoilers for the first three (and I'd suggest you don't, if you're going to read this series) you'd be best to go start at my review of Silent in the Grave. This is one series you really should read in order: plot points and characters from previous books return to haunt the present book, and are sometimes quite pertinent to the current action. You could figure out what was going on by a combination of explicit recap and inference, but you wouldn't figure out everything, and there is a richness that would be lost if you skip books. I do have to say, I didn't enjoy this one as much as I enjoyed the first three. It must partially be my situation, with significant sleep and attention deficits, but there are other books I've read in this period that I didn't have trouble getting through and that I enjoyed more. Because Lady Julia is away from London, we missed many of the London characters I've grown to enjoy, including her father, her brother Bellmont (he's fun as a straight man to every other March's eccentricities), Aquinas, Monk, and even the raven Grim. This is a significantly darker book than the first two, I would say even darker than the last. And yes, it's right there in the title. I'm a little afraid about the next one. So, from here on in be spoilers for the first three books; I will try to keep spoilers for this book out. 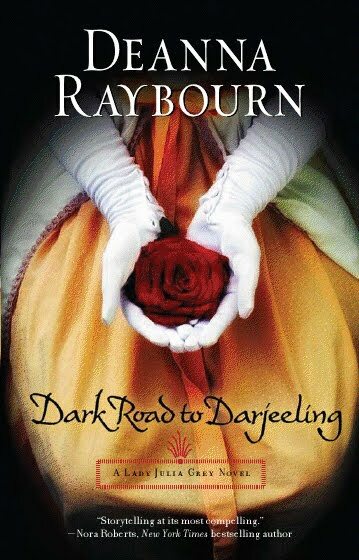 Dark Road to Darjeeling takes us to India, as Julia and Brisbane are finishing up their honeymoon. Julia's sister Portia and brother Plum find the couple and entreat them to come to India to visit Jane, Portia's former lover. Her husband (who also happened to be distantly related to the Marchs via their mother's family) is dead, and Jane fears for the safety of her unborn child, since the motive for Freddie's murder could very easily have been the fact that he had inherited a large and successful tea plantation. Upon arrival, it turns out that there are indeed an excess of suspects and motives, but no clear murder. There's also a rampant man-eating tiger, a mysterious Englishman in the mountains, and any number of strange and interesting characters living in the valley for Julia and her companions to work around and figure out. Part of the advantage, let's say, of having the first three books to establish things is that Raybourn can really get into the tangled web of relationships in this book. It's dramatic (at times melodramatic), convoluted, and very much a soap opera, which at times is quite a lot of fun and at other times seems a bit excessive. I might just be a little sour because of the aforementioned twist at the end, but I occasionally felt like things were just a bit over the top here. The tiger, introduced in the first chapter or two, of course does show up... but in such a way as to be the height of drama and at the expense of veracity. That whole storyline seemed a little forced and had little to do with the rest of the book, except perhaps to force a [resolution to a?] crisis point in Julia and Brisbane's relationship. Speaking of relationships, that's one place where this book shines. The relationship between Julia and Brisbane continues to develop apace, and there are significant bumps in the road as well as some lovely moments between the two. We haven't got a happily ever after here, though the reader suspects that there's no need to fear that the relationship is going to fall apart, either. The relationship between Julia and Portia has some really lovely moments too, particularly one where Portia takes Julia to task for horning in on Brisbane's business -- a moment that was quite welcome, because Julia is foolishly headstrong and needlessly reckless and also irritatingly competitive for much of the novel, and the reader is really glad to see Portia be sensible on the subject. I think what has me waffling a little about my feelings on this book is that it doesn't really fit into any categories easily, which is a good thing. It's not a romance series, though romance is an integral part of the story (and not just Julia and Brisbane's romance, either; we have Portia and Jane, and Plum and his tortured, unrequited love for his sister-in-law.) It's not a cozy mystery, though there are elements -- the closed circle of suspects, the incredibly bizarre crime, the somewhat unloveable victim whose murder is the catalyst for the story but not much mourned. It's too dark to be a cozy, and too reliant on previous books. But it's not a realistic psychological suspense read, either, though it also contains suspenseful elements -- it's too much a soap opera for that. So it's a little hard to pin down, but it's also pretty successful in what it sets out to do, which is tell a riviting story with a cast of interesting characters. I will continue to recommend this series, and I'll certainly be reading Dark Enquiry, the fifth book starring Lady Julia and Nicholas Brisbane. I'm looking forward to seeing what they get up to, and what the extended March family gets up to. I'm a little nervous about the darkness, and whether or not I have the stomach for it, and more to the point I think I am starting to find the dramatic twists and soap-style relationships and reveals a bit much. But I'm going to keep going because I really do like these books and I am quite confident that Deanna Raybourn has a tale worth telling. I'm looking forward to finding ourselves back in London with the attendant cast of characters. I just went to add the first book of this series to my list, and I found it was already there - probably due to one of your earlier reviews. Sounds like I'd better get to it soon! Ha! The first book is so much fun. I look forward to hearing what you think!